This is your last stop on this video hop. 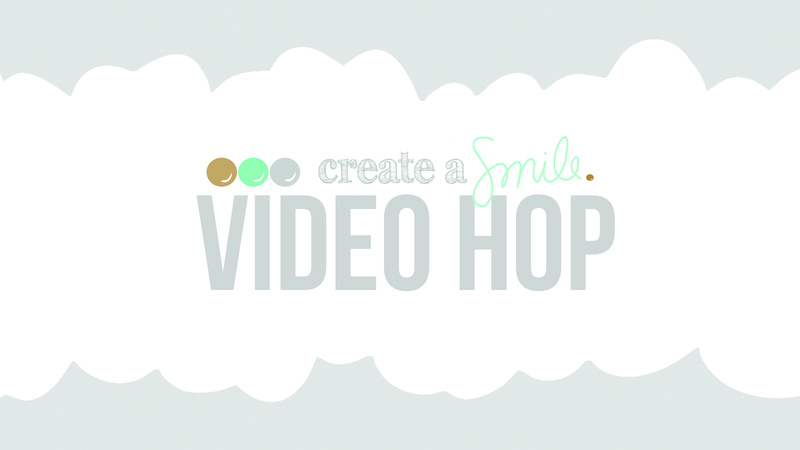 If you're looking for the first stop, hop over to the Create A Smile Blog! We hope you had a BLAST watching all the videos, getting inspired, getting to know some new products. What have you been most excited about? I will draw a random winner on wednesday October 29th. I'm not sure who to suggest you check out! Jennifer McGuire is always a winner in my book. Well all the blogs have some great inspirations, its not really possible to pin down on one...all are a must hop- stop! Your card is so adorable, I like the chipboard words very much! Your card is wonderful, I love you using the funny critter with the chipboard pieces. I adore Laura Bassen, her wit and wonderful style are unparalleled! She always makes me smile! Love the card! I am a big fan of Kristina Werner. Such a cute card! Love how you did the chevrons! I often watch Jennifer McGuire, but she's already on the hop. For scrapbooking, I like Gabrielle Pollaco. Thank you for the wonderful video tutorial! Love the stencil effect! Kristina Werner really taught me so much with her video tutorials and I would recommend her to anyone who loves stamping. Great card BTW! Great card, great giveaway chances! Thanks so much. I would suggest Darlene DeVries, Lindsay Weirich, and Kristina Werner. You had my other favorites already on your radar with the hop! Your other readers seem to agree, at least we are on the same page!! Thanks so much for the fun video hop:). The beaver is so stinkin' cute and so is your card!!! great card. Appreciate the guidance with the copics too! Very cute card. I can not pick one designer all had such great cards. Loved all the designer's projects. Very cute stamp sets. What a fun hop, especially since there were some of the best of the best showing off the products. Beyond all of them, I particularly like the CAS styles of Susan Raihala at http://simplicitybylateblossom.blogspot.com/ and Audrie Magno-Gordon at http://www.stampinup.net/. I enjoy creating books and journals, so highly recommend Kiala Givehand at http://www.kialagivehand.com/blog. Check 'em out -- you won't be disappointed. Oh wow. That's a tall order. So many talented YouTubers. I watch Lindsay, Kristina, and Jennifer, of course. Lately I have been plowing thru Kelly Donovan vids, but maybe she is more mixed media--still paper though. I recommend Jennibellie and Julie Fei-Fan Balzer. And Karen Burniston for her great dies and interactive cards. I really appreciated the stencil technique you used on this card. TFS. Jennifer & Vicky but also check out Nichol Magouirk. Awesome card Christine and awesome video hop I have really enjoyed it. awesome video hop! adorable products!!! beautiful! you need to check out https://www.youtube.com/channel/UCBaaEAFnS1cOaWSsMa9apjA i LOVE Sanketi's watercoloring. Hi Christine..thank you for introducing everyone, especially me to your blog and store. Your products are awesome. I must say how you used the chevron stencil was neat. I loved it. i want it too. I ask that you take a look at Arlene Cuevas at. Mybutterflykisses12. On utube. Everything she creates is incredible. She has such vision. And then theres Kristina Werner my absolute favorite artist. i know you know her, because Jennifer McG. Is in this video hop...they go hand-in-hand. LOL. Very cute card! Wishing you great success with your new company! Very cute card. I love the way you did the beaver tail. I subscribe to BethsScrapbookRoom which is so fun to listen to. She is very warm and funny. Every month there is a challenge where she collects the projects and sends them to various charities - It feels wonderful to create a project which may go to a hospital, nursing home or people who serve our community. Please visit her. TFS. There are so many great crafters that I watch. The Frugal Crafter is very fun and interesting and gives great advice on a variety of different things. I love the card. As for where I get interesting ideas from would be jennifer mcguire, vicky papaioannou, pootlespapercraft, the frugal crafter and K werner design. Each always shows me something different and love all the advice they have to offer. I think u all did a wonderful job on the cards and tags along the way. I really like the snowmen in the set but so many cute things. Thanks for sharing and for a chance to win. Your card is so adorable! I truly enjoyed your video and appreciate how you took the time to share every detail as you worked your clever and creative magic. You really did one outstanding job!! Love the background and the beaver! Great card! Your video is great and I love your card. The little beaver is adorable and thanks for the tip for making the stencil a little sticky. I always have trouble keeping them in place so I will have to try the spray mount. Love your card! I think the beaver is adorable and can be used in so many creative ways! one of my favorites is Sandy Allnock! She is a wonder with the Copic markers! What an adorable card and great video!!! Thank you for all of the tips you shared about using intricate stencils. This was such a fun hop!! The Create A Smile products are so super cute, and I "met" some new crafters along the way! YAY! One of my favorite crafters who also makes videos is Michelle Short. I do love Jennifer McGuire. She really keeps me organized. Your beaver is adorable! Great card and great hop! Super cute card!! I love that stencil background you created for that darling little beaver!! What an adorable card! Just adore that sweet beaver. He's just so sweet. Lovely work. I subed to you're You Tube channel under (499faith). Love the wooden pieces. I always watch Jennifer McGuires videos as she has such great ideas and Kristinia's video channel. Thank you for the great video. Will be looking at you're others. i can't imagine i have a video crafter to suggest that you don't already know about since most of the ones i follow are doing this blog hop! LOL! i also like kristina werner's videos but who doesn't? Cute card! The squirrel is so cute! Hallo Christine, ich bin ein grosser Fan von Kristina Werner. Deine Bieberkarte ist super - aber mit dem süssen Kerl ist das ja auch nicht schwer :-) Ich mag die Art wie Du den Schwanz koloriert hast!!! Tolle Stempel, werd ich mir sicher auch bald ein paar zulegen! Hi! Thank you for sponsoring this hop. I had a lot of fun and picked up some wonderful ideas. The beaver does look a bit clumsy, now that you mention it. But, what a cutie and so fun to color. Some of my favorite bloggers are on the hop, so let me recommend Kristina Werner (www.kwernerdesign.com) and Sandy Allnock (www.sandyallnock.com). I love the chipboard! Kristina Werner (kwernerdesign.com) is a favorite of mine! Brilliant! That beaver is just adorable! Darlene Designs is a great watch and of course Jennifer McGuire! TFS! You've got some great stamps! And I love the card you made! Most of the people I was going to recommend were already mentioned, so I guess I'll just second Nichol Magouirk, Kristina Werner, and Jennifer McGuire. Thanks for sharing your card! Great card, one of my favourite carmakers is Kristina Werner. What an absolutely adorable card!!! I was thrilled to see how you made your background! Your whole card is adorable, thanks so much for sharing! A great tip about the spray adhesive and not letting it be too sticky! Super cute card! I am crazy over that sweet little beaver! I just have to have him! His name will be Fred! Thank you for showing us how to use him. Awesome card and love the stencil too. I always like Kristina Werner's videos. The beaver and stamp set is adorable! And your background came out beautiful! Be sure to check out Laura Bassen's site... she's a hoot, as is Lindsey, The Frugal Crafter. Lindsey's older videos are the funniest as she used to add silly and snarky comments in text over the video that were just as entertaining as the actual craft tutorial. Another fav of mine is Jin from Under A Cherry Tree. She has great Silhouette tutorials. Love the card! I would suggest Grammie2bay on Youtube. She is a hoot! Thank you very much. Your colouring is incredible, love his little waffle patterned tail! I loved the video hop. Lots of inspiration and amazing card makers. I suggest you to watch Irit Landgraf videos, I love her LOband techniques. Awesome background and adorable card. Love the cards and the video hop, really some great ideas. check out Nicole Magourik, she does great work with lots of cute critters too. Cute card. I love that stencil! I adore you little beaver! And your stencil background. You had very talented people on your hop. Thanks for introducing us to some gals we would not have met otherwise met. oh is a super beauitful card and so cute!! This video hop was so much fun! Since you already invited some of my favorite cardmakers I don't have any suggestions for YouTube. you are so right the beaver is sooooooooooo adorable great card and copic coloring. where did you buy the big foam tape ??? Great video and fabulous cheery card! Love the beaver!! Great hop, very inspiring! I think you should check out Kristina Werner's blog and you tube channel....she's a fabulous card designer! So sweet! I just love the background the the wood veneers are amazing! Great techniques and ideas! I am learning so much from this blog hop! These stamps are really so cute! I like videos from Jennifer McGuire and Nicole Magourik and the lawn fawn designers are great as well! Happy video watching! Love your card, it was a fun hop! TFS you already have in your hop 2 of my favorite video artists, Jennifer McGuire and Laura Bassen, I would recommend Kristina Werner as well. Thanks for the chance! darling card! love that cute beaver! great coloring! I always enjoy Kristina Werner's videos! Your background with the chevron stencil is stunning. Thank you for showing us that technique and also for the trick with the spray adhesive. The little critters in the stamp sets are my favorites and lend themselves well to a variety of card themes. A very sweet card with an adorable little critter. Thanks for sharing it with us. Great hop, Christine! Love the stamp sets as well. Not sure who to recommend...you have such a great line-up of crafters already. I'm sure others have mentioned Kristina Werner, Sandy Allnock, and Nicole Magouirk. There are so many awesome papercrafters out there, it's hard to name them all. I love Debbie Higher at Lime Doodle Design, Jane of Janes Doodles, and Stephanie of Clearly Besotted .... oh and Michelle of the Card Grotto too. Love your video and blog hop.... you did an amazing job at getting everyone together and what big names!!! You did good!!!! Sorry that should have been Debbie Hughes of Lime Doodle Design... stupid auto correct! I always find so much inspiration at your blog. Love this card and the video is just perfect! So many creative artists...I enjoy them all, but particularly Jennifer McGuire. Your card is really cute! Such a nice blog hop and a very inspirational card! Thanks! I guess you know most of my favourite video artist already, since you've invited quite a few of them to take part in this hop. I always enjoy Kristine Werner's videos, esp. her Holiday Cards series, but I've also recently started following Dawn Woleslagle of Wplus9. Her videos are always a joy to watch. This little beaver is just adorable. I love your gorgeous stencilled background. I love Sanketi's gorgeous watercolouring. For copic colouring I love watching Sandy Allnock and she is so funny too. Such a cute card! Im a fan of Nicole Magouirk, Kristina Werner and Dawn at Wplus9! Great card, I really like the critter stamp sets they are very cute. I usually go to Jennifer McGuires blog and that's about it. thanks for the inspiration!!!! I love the beaver and being Canadian - I do love beaver stamps! I like Jennifer McGuire, Kristina Werner, Tim Holtz, Julie Ebersole and Debbie Hughes. I do have my own channel Justine Hovey. Wow!!! Awesome video and card!! Love how you used the adhesive with your stencil!! Great idea!! Such a cute card! Thanks for the video and for sharing your talents. I love watching videos from Julie Fei-Fan Balzer. She does a lot of art journaling and mixed media. I think she has more videos on Vimeo and her blog than YouTube, but I always learn something from her! Cute card! Thanks for the very clear video. The beaver is indeed a cutie! So cute :) Love the gorgeous BG ! Such a fun hop! Love your beaver and the waffle detail to his cute tail!!! Awesome card. Great background technique and the beaver is so cute. Lovely beaver!! Check out this blog - http://www.elli.com/blog/ - very feminine and very lovely, i think you will enjoy it. Also, thank you for the chance of winning the givaway. Sooooo cute. Love your card !! This beaver is absolutely adorable!!! LOVE your card and the hop was fabulous, full of inspiration and tips I cannot wait to try! Thanks for sharing! Forgot to mention, you got two of my favorite designers in your hop Jennifer Mc Guire and Laura Sterckxx. Have you checked out Nichole Heady or Nichole Macgourik? Hi Christine are you the one behind the create a smile brand? everything is awesome! 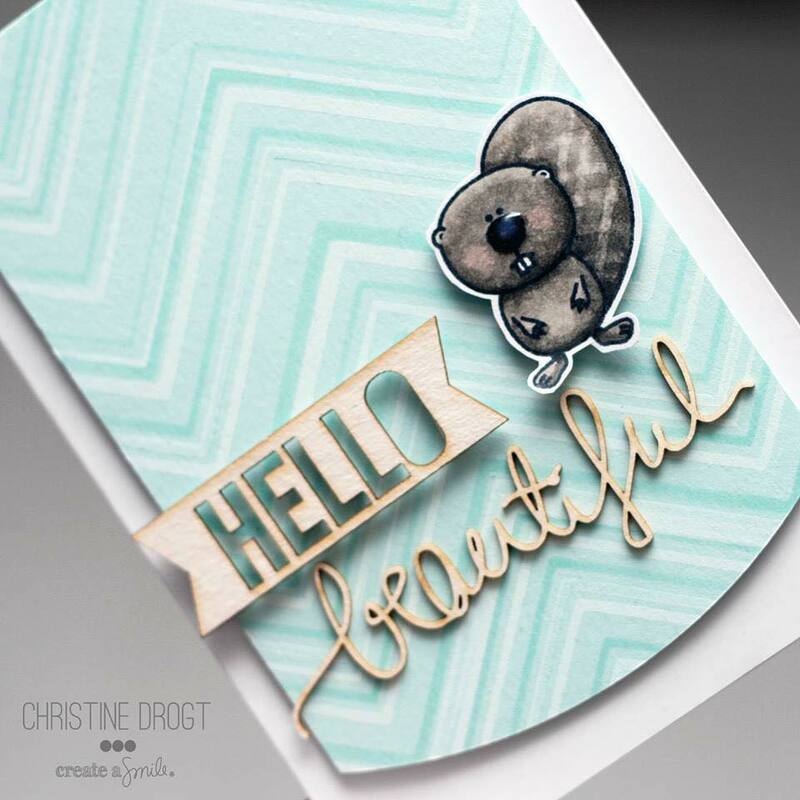 Loved your cute beaver card and the effetct you achieved with your chevron stencil. I love to watch Joy Taylor, Julie Ebersole, Jennifer McGuire and Sherri Carrol among other ones, hope you like them that its if you don't yet know them, I know you know Jennifer, but I could not not mention her because she has been one of my favourites treachers ever!!! Hi Christine, I just loved that background on your card. Just stunning. Thanks for the inspiration. I really enjoy watching Jennifer McGuire for inspiration. Oh ! Lovely card ! erstmal meinen herzlichen Glückwunsch zu deinem tollen Video-Hop. Ich bin begeistert, wie viel Anklang die zauberhaften Create-a-Smile-Stempelchen weltweit finden. Aber die sind ja auch einfach nur toll. Ich freue mich schon auf das nächste release. I really love the wood embellishments! Your card is super-cute! Wow, I really loved all the videos on this hop, I LOVE your idea for keeping the stencil in place--so awesome, and then to cut the curve too!, I have to say I usually go to Jennifer McGuire to watch all her videos. Yours was AWESOME too. Such a cutie pie beaver - love the background design and coloring plus the sentiments went perfect! Very cute beaver card. I like the curved edge and the chevron background. I like Sandy Allnock's videos. Hey Christine!! Your card is fabulous. I love the stencil look so pretty. I need to get that spray you talked about. I have some stencils that need that. Thank you for sharing and thank you for such a great hop!! No doubt you know them already, but my top 3 favorite crafters are Shari Carroll because of the sophistication and intricacies of her designs, Jennifer McGuire because of her creative & fun new techniques; and Julie Ebersole because of her creative designs and her absolute joy. I'm delighted to discover you through this CAS Blog Hop. Very beautiful card! I ove Jennifer McGuire's videos too. Gorgeous! I always love watching those videos and seeing the beautiful creations! Hi, just wondering if you posted who won the stamp?